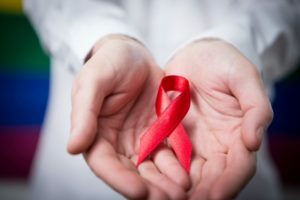 If you have HIV/AIDS and cannot work, you may qualify for Social Security disability benefits as long as you meet our disability requirements. We pay disability benefits to people who can’t work because of a medical condition that’s expected to last at least a year or end in death. Your medical condition must also be serious enough to prevent you from doing substantial gainful work. We pay disability benefits through two programs: the Social Security Disability Insurance (SSDI) program and the Supplemental Security Income (SSI) program. The SSDI program provides benefits to disabled or blind people who worked and contributed to the Social Security trust fund as required by the Federal Insurance Contributions Act. Our other program, SSI, is a means-tested program that provides assistance payments to people who are aged, blind, or disabled and who have limited income and resources. SSI benefit payments do not come from the Social Security trust fund. Read our publications, Disability Benefits and Supplemental Security Income to learn more about our disability programs. If you are disabled, but would like to try to return to work, our Ticket to Work Program is designed to help you decide if working is right for you, prepare for work, find a job, and maintain success while you are working. Social Security also offers work incentives to help people with disabilities work and receive cash benefits and/or maintain medical benefits. For more information, please visit the Choosework website. Our publication Social Security for People Living with HIV/AIDS explains in detail how our benefits work, how you can qualify, what you need to apply, and how our claims process works. The most important thing is, if you think you qualify for benefits, don’t wait, apply today. We’ve come a long way since the first World AIDS Day on December 1, 1988. Until a cure is found, awareness and education are key. Please share this blog to help us spread the word about these vital services to someone who may need them. This entry was posted in Disability and tagged AIDS, benefits, disability benefits, HIV, social security disability, ssi, supplemental security income, World AIDS Day by Jim Borland, Acting Deputy Commissioner for Communications. Bookmark the permalink. Happy holidays everyone who believe life is journey start in the beginning and the end.that’s could be victory. Thank you, Shelly! Your thoughts are important to us and we’re pleased when feedback is positive. We try hard to provide the best possible service to our customers and your satisfaction is our reward. It’s really helpful information for the Social Security! Thanks for making aware us!